Bring style and dimension to your bird garden with the Wing and A Prayer Classic Bluebird House with Verdigris Roof. Clean lines, crisp color, and modern materials make this home a welcome addition to any bluebird trail or backyard sanctuary. The tall body of the home, crafted from square PVC tubing, offers plenty of room for a bluebird family. This material will not mold, mildew, rot, or delaminate, retaining its shine and integrity. A 1.5" diameter entry hole rests at the front of the house, welcoming birds into it, with a piece of PVC trimboard around it to extend it. This prevents raccoons from reaching into the nest, and a verdigris colored metal guard atop the trimboard keeps squirrels and woodpeckers from enlarging the hole. A steep metal roof covers the house, with a light green finish for an elegant touch. This roof may be removed for cleaning, and will retain its verdigris hue through the seasons. Place the included white finial into the opening at the top of the roof, completing the piece. The finial removes with ease for quick nest checks, and helps the home stay ventilated for nestling safety. Wooden blocks keep the floor in place at the base of the home, and elevate the nest from the floor to protect it from captured water and parasites. An extended platform around the base creates places for bluebirds to land without a perch, and an attached collar allows the item to mount onto a true 4" x 4" post (not included). 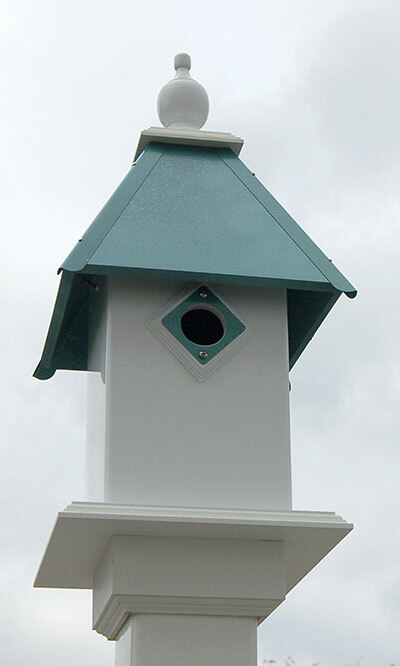 Add a designer look to your bird garden with this Classic Bluebird House with Verdigris Roof. Made in the USA.